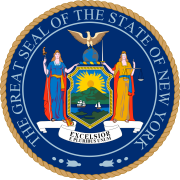 The 1872 New York state election was held on November 5, 1872, to elect the Governor, the Lieutenant Governor, a Canal Commissioner, an Inspector of State Prisons and a U.S. Representative-at-large, as well as all members of the New York State Assembly. The Republican state convention met on August 21 at Utica, New York. William A. Wheeler was president. John Adams Dix was nominated for governor by acclamation. John C. Robinson was nominated for lieutenant governor, Lyman Tremain for U.S. Representative-at-large, Reuben W. Stroud for Canal Commissioner and Ezra Graves for Prison Inspector. The Democratic state convention met on September 4 at Wieting Hall in Syracuse, New York. Lester B. Faulkner was temporary chairman until the choice of George M. Beebe as president. The Liberal Republican state conventions met on the same day at Shakespeare Hall in Syracuse, New York. Reuben E. Fenton and John Cochrane were the most influential delegates. Truman G. Younglove was temporary chairman. DeWitt C. Littlejohn was to be president, but had not arrived. During the day, haggling with the Democratic delegates about the state ticket continued, then the convention adjourned. On September 5, the conference committees of both conventions agreed upon a division of the slate, and the Democrats proceeded to nominate Francis Kernan for governor in the middle of taking a second ballot (on the first ballot, Sanford E. Church had received 15 to 20 votes), and John F. Hubbard, Jr. for Canal Commissioner. The Liberal Republicans then nominated Chauncey M. Depew for lieutenant governor by acclamation. A large Republican majority was elected to the State Assembly for 1873. Canal Commissioner Reuben W. Stroud John F. Hubbard Jr.
^ in the press referred to as "Greeleyites" or "Soreheads"